I remember as a very young child being intrigued by the stuffed owl on the desk in my father's study. That owl always seemed to be looking at me, no matter where I was in the room. He followed me with his eyes the way the moon appears to from the window of a moving train. My father died when I was eight, and the owl also mysteriously disappeared to unknown realms where I evidently could not follow. Perhaps influenced by this experience, owls have long been one of my favourite animals, especially the barn owl. They have even featured as characters in one of my books – but that, as they say, is another story! 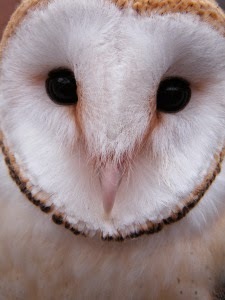 Have you ever looked into the eyes of an owl? Most birds look with one beady eye at a time. With an eye on both sides of the head, they have a wide view on the world – handy for both those who prey as well as for those who in their turn are preyed upon. Not so the owl. As with a human's vision, both his eyes are in the front of his head. He almost looks at you in the same way as we would do, and perhaps for this reason seems closer to us than the chatty parrot, who seems able to 'talk', but who is really only mimicking sounds. The owl has an observing glance, observing and inscrutable. No other bird looks at you in quite this way. Is this the reason why this bird of the Greek goddess Pallas Athena has acquired a reputation for wisdom? It is true enough that the eagle, for instance, has a fierce look, but that look is different from the owl's inscrutability. The eagle looks out at the world. But we do not have the idea that he is ‘aware’ of his own gazing. His is the remote, dispassionate stare of a calculating hunter. In contrast to the calculating and passionless eagle, the owl seems to wish to involve us in an unfathomable, unspoken conversation, almost as if it is seeking a dialogue. Recently I looked again into those eyes, this time those of a barn owl that was perched on the heavily-gloved hand of a staff member at our local petting zoo. What did this particular owl have to say to me? What message did it wish to convey through those night-dark eyes? Perhaps (or so I fancied) the owl’s inscrutable gaze was a reminder to me to remain focused, not to allow myself to become distracted by the events happening to right or left. If the owl does this, then he goes hungry – and so do I. Not for my next meal, but for missing the simplicity of the moment, for not acknowledging and accepting what is directly in front of me on my path, whatever that happens to be. If I look away, then I so easily can become drawn into the emotions of others – emotions which are not my own, even if they are directed at me. Dear, wise owl! Now I realise what golden word you uttered to me in your silence, what I see reflected in your dark eyes. It is equanimity. interesting post. I too feel drawn to them. I saw some last May and had a chance to touch the featery back of one of them. You're right about their gaze, there is something to it. A message. I think of transition whenever i see an owl. Or perhaps as you say they teach and remind us to look within, to focus on being present and enjoy the moment. How nice that you actually had a chance to touch an owl, Feathers! These contacts, however momentary, can still give us a feeling of entering a non-human world. Thank you for your appreciative comment. I truly enjoyed reading your story about these wonderful creatures, their symbolism and what they mean personally to you! They are truly beautiful and magnificent. There is a a Tawny owl close to my bedroom in Canada. I'm next to a fruit orchard and the owl is probably hunting for voles and mice. I find their hooting reassuring and calming. Joseph, aren't you the lucky one then, having the personification of "wisdom' so close by, to calm and reassure you with its hooting! I wonder if you have ever paused with the thought that this tawny owl might have chosen to be close to you for the same reason? I must say Emma that is a novel thought! Then we shall keep each other company - the owl and I. We will share our dreams and bless each other's presence. I can so easily believe that your owl seeks your company, so why not seek his in spirit?